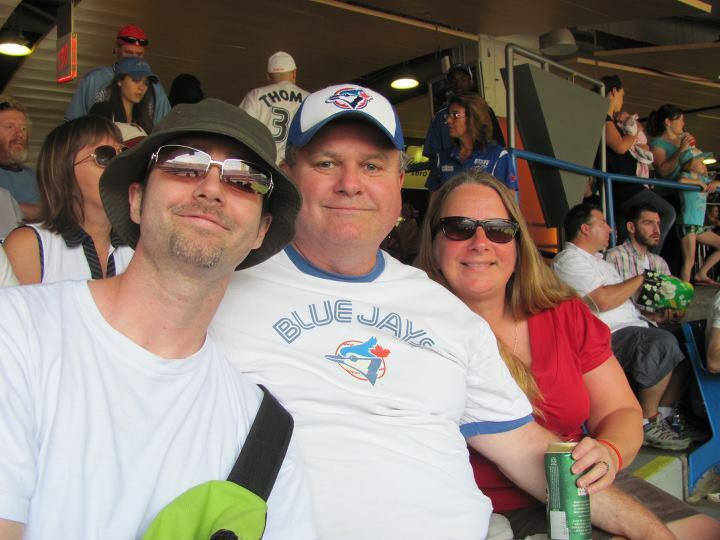 Ken and I missed Father's Day together so we decided to get together for today's Blue Jays/Phillies ball game. Teena came along which made it a perfect day for me. The Jays lost but you couldn't ask for a more entertaining game. Roy Halladay, who came up through the Jays system and was the Jays ace for many years before being traded to Philadelphia, was on the mound for the Phillies today. The fans gave him a huge standing ovation when he first came onto the mound to throw his warm-up pitches. It was great to see. Toronto fans are a class act and so is Roy Halladay. He never tipped his hat to the fans but when in a game is all work, so can be forgiven. Halladay didn't acknowledge the fans at any point, saying he did so out of respect for the Blue Jays and his reluctance to be "the center of attention." It was a back and forth game until Chase Utley hit a two run homer to take the lead 4-3. A close play at the plate in the 9th gave the Phillies an insurance run and lit up the fireworks. John Rauch, the Jays relief pitcher, stormed the mound and yelling at the umpire and also put his glove inches from the umpire's face. He was then ejected and it started. As he started toward the umpire, John Farrell, the Jay's coach got between them. 6'10" Rauch tossed him out of the way and continued towards the umpire. Many Jays got in the way and Farrel grabbed Rauch's ball shirt which ended being stripped off. The fans went crazy, all on the Jays' side. When the dust settled, Rauch and Farrell were tossed from the game. In the end, the Jays lost 5-3. Although they lost it was a great afternoon. Afterwards Teena, Ken and I hit St Louis across the road for wings. It was great seeing Ken again and I always have a great time when Teena, Ken and I all get together. It was great to stand up and welcome back Roy Halladay with a standing ovation. It would have been better if he had lost, though. Carlos Villanueva, who is also a Rumrunner (my fantasy baseball team), was the Jays' starting pitcher. He had some control problems but left the game with the lead. Eric Thames, a recent Rumrunner addition, was 2 for 4 at the plate today with an RBI. Here he is getting his first hit of the game. Jose Bautista hit his 26th league leading home run today. I did not get a shot of the hit. Here he is in action today, though. Ken's friend, Brad, was at the game in another section and he and Ken texted back and forth. Unfortunately Brad was in the bathroom for Baptista's home run and the fireworks with Rauch. Too funny! A fan decided to run onto the field. Bad move. Taken away in handcuffs and a $1500 fine! John Farrell continuing to argue after being tossed from the game.